While pizza and pasta are just the tip of the Italian (and Eatalian) iceberg, there's a reason they're two of the country's most beloved exports. 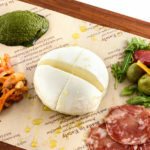 At La Pizza & La Pasta, one of four distinct restaurant concepts at Eataly Boston, guests can enjoy a seasonal selection of these two culinary staples just steps away from where the expert pasta chefs and dough-slinging pizzaioli (pizza makers) create the dishes from scratch. Eataly has always adhered to centuries-old Neapolitan technique when it comes to pizza: the crust must be tall and tender, the dough should be left to rise for at least 24 hours, and the ingredients should display the bounty of the Mediterranean. They’re just as particular when it comes to pasta. The restaurant boasts a bountiful selection of signature pasta dishes that use housemade fresh pasta as well as specialty dry pasta imported from Gragnano, the birthplace of dry pasta making. Diners can enjoy any of 100 regional Italian wines with their dinner or while they wait for a table – like its namesake foodstuffs, La Pizza & La Pasta has a lot of fans.